There were a couple of things that caught my eye on the internet today. One was this photo. The other was something I read in an email. You can read the whole article here, but this part stood out for me. "The reality is we all get afraid. It’s not about being afraid but what you do when you feel that way. When you feel doubt, or fear, or anger, or frustration, know that you can let it go just as surely as you can pull your hand away from a flame. Keep your life focused on the goodness, on the possibilities and on your most treasured dreams. What begins in your mind ends up in your life. Think continually of the way you would like to be, let these thoughts drive your actions, and your reality will reliably catch up to your thinking." So maybe you are wondering why I put these two together. Well, a long time ago someone set that bike up against that tree and left it there. 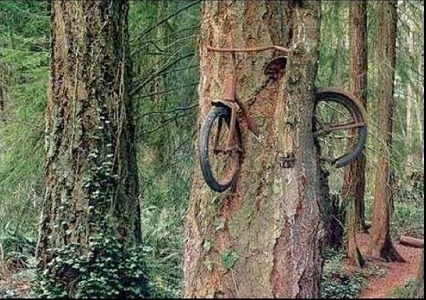 Over the years the tree grew around the bike and the bike became old and rusted. It virtually became part of the tree. That bike didn't have much choice as to whether that tree took over its life, but we do. We can decide to pull away from the fear and anger and not become part of it. We can walk away from it. No, that does not mean we are being disrespectful of the events that happened. It means that we choose to rejoice in our lives and work to change things so that events like the one at Sandy Hook last week don't happen again. The things we do can be big or small. They can be as simple as sharing a smile with a stranger or kissing a loved one. Or they can be larger like writing about gun control and mental health access on your blog or contacting your representatives in Washington. If we let events like this take over our lives then we will become like that old rusty bike. 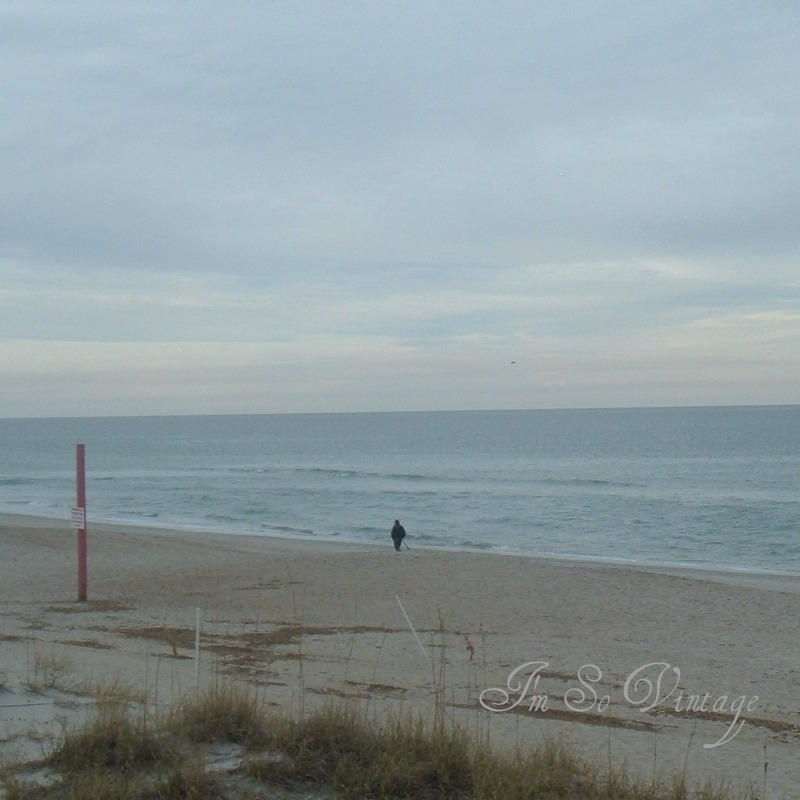 So often we feel like we are alone in all of the chaos, as if we are the only one on a long empty stretch of beach. But we aren't alone, and the wonderful thing about a beach is the water is always coming ashore and bringing new sand. That is what our lives are like. The old things are constantly being washed away and new beginnings are happening all the time. So, my hope for all of you my sweet friends is that you will never forget the tragedy that befell our country, but that you will choose to remove your hand from the flame and remember all of the wonderful things that life still holds for you. Very well said, my friend. It alters our lives and how we deal with whatever comes our way affects our lives forever. I pray a lot and strive to be kinder and more tolerant of those around me. The only person I have control over is....me! I try to be the best that I can be and if we all do that, it will be a better place to live. Enjoy your day, my friend! Thank you for writing this Laura! It is how I feel. I am sad and stunned by the events of last week but life does go on. I choose to be happy and I choose JOY! My family deserves the best I can give them and that means living life each day to it's fullest. Sending you warm and loving Christmas Wishes! Very well put-- I agree. Beautifully written. Thanks for sharing this powerful piece. Thank you for stating this. Happy Holidays! Very well-written post, Laura. I wish you'd write more like it because I love how you found such an amazing photo and related it to current events. I sent out and spent more than I should at Pier 1 because the stuff in there was making me smile. I rarely do retail therapy unless it's in a bookstore, but it did make me smile, and I hope it lifts my family's spirit, too! We are all sad about the horror that happened at Sandy Hook. We have to try to learn from it. That means loving our children and keeping them as safe as we possibly can. We need to love one another as God intended. Merry Christmas to you Laurie. Thank you for putting into words what so many of us needed to hear. It's difficult to put the fear in its place and move forward but we must. It’s all we can do, Laura. Move on with moving on. I pinned that photo and the original story of the WWI soldier the other day. I’m glad you found it. Awesome! The bike in the tree is a powerful image. You have managed to put into words thoughts and feelings I've been wrestling with all week. A beautifully written and timely post. Thank you so much. Thanks Laura. Meaningful post Laura, just the right words to help us all through this.